In this recipe, pork chops are seared and then simmered in a simple but flavorful orange sauce, leaving them glazed and delicious. These chops make an easy everyday meal your family will love. Serve them with a rice dish, mashed potatoes, or sweet potatoes along with steamed green beans or broccoli. Coleslaw or a tossed salad would complement the chops nicely as well. Place the pork chops on a cutting board or sheet of parchment or wax paper. Season both sides with kosher salt and freshly ground black pepper. Dust lightly on both sides with flour. In a large heavy skillet or saute pan over medium heat, heat the olive oil. Add the pork chops to the hot oil and cook for about three to four minutes on each side or until browned. Meanwhile, in a small bowl or cup combine the orange juice, brown sugar, marmalade, and cider vinegar. Stir or whisk to blend. 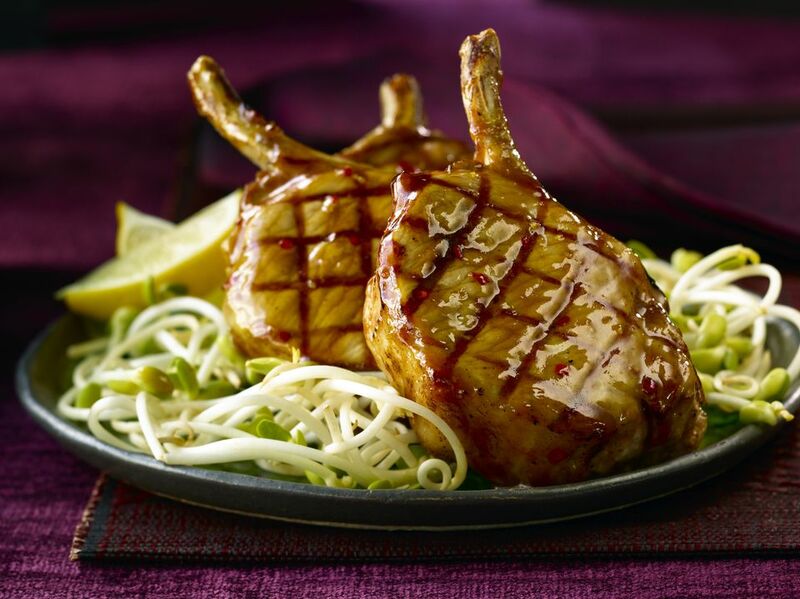 Remove the pork chops to a plate and drain off or wipe out any excess fat that has accumulated in the pan. Return the chops to the pan. Remove the pork chops to a warm platter and tent loosely with foil to keep them warm. Bring the sauce back to a boil and cook for three to four minutes or until reduced and thickened. Spoon the sauce over the pork chops and serve hot with rice, potatoes, or your favorite side dishes. *The National Pork and the USDA recommend using a digital food thermometer to ensure that pork is cooked to at least 145 F. Ground pork must be cooked to at least 160 F.
When choosing pork, look at the color. It should be pale pink, and any fat or marbling should be white, not yellow. Avoid buying darker pink or grayish pork. Thick chops (around one inch thick) will be more tender and juicy than thin chops as long as they aren't overcooked. Cooked pork should be refrigerated within two hours of cooking. Refrigerate pork leftovers for up to two days.